Ok those Rambutans are awesome!!! Do tell how those taste. I want to try one!! I would like to join you but I live in a rural town that is probably a 20th of the size of NYC. 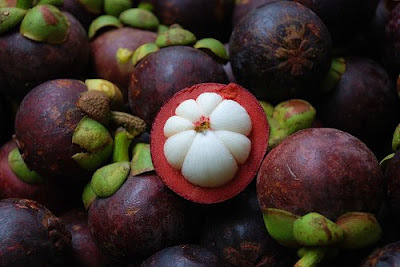 mangosteen are delicious!!!! I had loads while i was in thailand. I think they taste like custard. Does anyone know why they are forbidden??? I cant think of any reason. Lara: Not because of the fruit itself, but because of the bugs and other pests that might make it to the US inside the fruit. They've started irradiating the fruit to kill any pests it might be harboring. wow... radioactive formerly forbidden foriegn fruits, that makes me want to try it even more! haha try saying "formerly forbidden foreign fruits" four times fast. Yangmei looks gorgeous. I'm going to go digging in Chinatown for it. Pah. Cherimoya is called custard apple here. I've seen it before but never tasted it - the name doesn't sound as appetizing, I guess. I just found out yangmei was considered for introduction into Australia! The government seemed to think they could help the ecosystem in some way, according to other reports I found. logan!! (love that stuff, but if you eat too much of it, it'll make your nose bleed XD Their actual translation is "Dragon Eye) All I know it that Taiwan has ALOT of weird fruits! And Catgirl, I LOVE RAMBUTANS TOO! My cousin has a yangmei tree in her backyard! Have you considered star fruit?? Ohh ohh! What about "saturn peach??" (it's shaped kinda like the ring of saturn, a flat peach, another one of China's weird products, lol But if your're searching for a picyure of it, I reckon you not, it has many different names it's literal translation from Chinese it "flat peach")Erm.. budda's hand?? (never tried it) Uhh... (what I'm about to say is not a fruit, but it's really weird! )Threr's a mushroom that has hair growing outta it, no it's not growing mold. It's kinda creepy and it taste's funny (my dad likes it). It tastes like you're swallowing a furball. Well, it looks like a fur ball. Ooh! I think I've had Longan! At a party I went to they had these weird little berries that looked like fish eyes, and they had a sharp, tangy, watery taste. omg i LOVE jabuticaba!!! they're sooooooo yummy!!!! I've had dragon's eye. My mom got it from where she works. She works at this place where artists and writers from the US and the world come and work. Hey, you could come ananka! that would be so awesome! Those rambutans look like Seussfruits!! Ananka: Oh, right.....have you heard of Durian??? I had the chance to try it but i just couldnt bring myself to. There is NO WAY you would find it here, tho because they are not even allowed to transport around SE Asia, i think. I have tried Cherimoya and I really don't like it. I think it don't even have a taste! I have had rambutans and salak. Both are nice. I suggest you put a peg on your nose and try durian. I don't think you'll like it but try it at least once. They love it in Indonesia and you can get lollies and ice-creams of that flavour. Lara, The Durian fruit growns in my home town Miami, Florida. I've had the chance the try it but it smells so awful I just couldn't do it. Actually I've had most of the fruit listed. I remember my dad (who is originally from Jamaica) would bring Pitaya (Drangon Fruit) to my house one day. It was just so interesting I had to try it. Once it cut it open I was sorta of turned off but once it touched my tongue, WOW! It's something you have to try if you haven't already. I also ate Cherimoya weekly but, I was warned not to eat the seeds because they're poisonous. There are some place in Miami that will ship some of those fruit to you. It might take a well but they are worth the money and the wait.